I've extended the number of players on show for this week with the double and all. 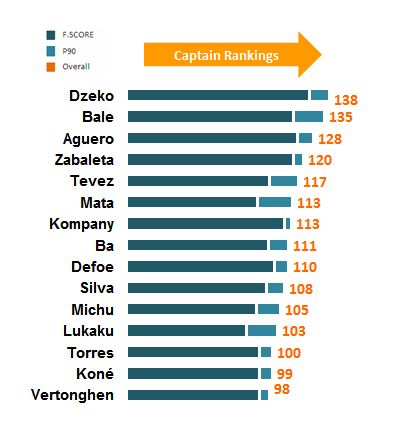 Personally surprised to see Gareth Bale so high when City have such a pearler of a double fixture but I guess this just shows how amazing Bale is and that City have not quite been at the party this season. The Welshman was similarly high up in these rankings last week too and did pretty well so I shan't argue. Good Luck. Cool. Glad that I'm a Bale capper. Any chance you could pull up the GW35 Match Centers today or tomorrow? Sorry Lux but I've had a. technical malfunction and my xls is a bit broken. I should have it fixed this week. Lux, I will not get around to doing Match Centre on the blog but if you email me at shots_on_target@hotmail.co.uk I'll send you the raw data.